Leonard Pitts writes a column that appears in our local paper on a regular basis. In my opinion, what he says is usually interesting, and I admire his ability to present his points with clarity and passion. Ironically, I almost always disagree with him. Today was no exception. In this current column he demonized a significant portion of the American public. This is how he concluded his October 9, 2014, column titled “Cheerios, gay marriage and the Supreme Court” which appeared in Highlands Today.
. . . conservatives now find themselves stuck on shrinking islands of intolerance in a swirling sea of change. This was the last sentence in his column focusing on the Supreme Court’s inaction this past week regarding the issue of marriage and equal protection under the law. He indirectly implies that all conservatives are intolerant. He arrives at this conclusion based upon his interpretation of the comments made by some public figures he considers to be conservative. In fairness to Mr. Pitts, the main point of his column appears in this paragraph. In avoiding a decision, the court makes a decision, if only the decision to tacitly acknowledge what already is. If one might have preferred a declarative statement supporting marriage equality in all 50 states to an implicit recognition of marriage equality in the places it already exists, well this non-ruling is still seismic. Yesterday, I expressed my sentiments about these legal and moral issues in a post on this website at Marriage v. Marriage. Today I will focus on the unacceptable practice of demonizing, and Leonard Pitts has offered a convenient example. When we stereotype in such a way that wrongly or unfairly alleges a group is evil and opposed to what all good and earnest people stand for, we are demonizing. Maligning someone as a racist, a bigot, a homophobe, a sexist, or as a denier of history or science would be defamation if it were untrue. Wrongfully labeling an entire group of people in this manner is demonizing.
. . . there should be a law that lets authorities punish skeptics and deniers – those who engage in “selling out the public trust,”. this is a frightening worldview! He considers himself the gatekeeper of truth. Those who dare to offer contradictory ideas he calls skeptics and deniers, and he wants them punished by the authorities, the government. Leonard Pits apparently believes that conservatives are intolerant. Does he actually know if they are more or less intolerant, on average, than moderates or liberals? Of course he doesn’t. Is anyone tolerant or intolerant all the time? What is a conservative, or a moderate, or a liberal, anyway? They are labels with ambiguous meaning. Frankly, we don’t even know what it means to be a Democrat, a Republican, or an Independent unless we register to vote in a state or territory that requires such a declaration. 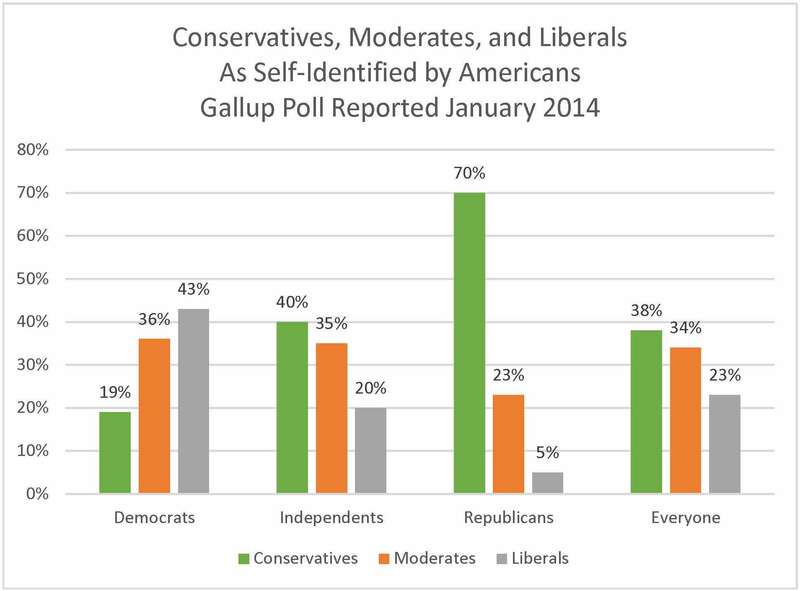 For more than 20 years, Gallup has been polling Americans about these labels. They’ve asked us whether we consider ourselves conservative, moderate, or liberal. The polls have also considered the differences in how Democrats, Independents, and Republicans identify themselves by these labels. Here are the results of the most recent poll. Indeed, we all fall into this trap of stereotyping. Individuals who consider themselves to be Democrats, Republicans, or Independents often use negative stereotypes to denigrate their political opponents. Demonization is extreme negative stereotyping, and it is wrong. I don’t give credence to many political advertisements, but I do pay attention to candidates for office who use these tactics. First of all, most of what they present is dishonest, and then it’s presented with the intention to vilify the opposition. No wonder our politics is so polarized. This entry was posted in Human Behavior, Politics and tagged Conservative, Defamation, Democrat, Demonizing, Gallup, Independent, Jr., Leonard Pitts, Liberal, Moderate, Republican, Robert Kennedy, Stereotyping. Bookmark the permalink.